Definition at line 2115 of file lscript_tree.h. Definition at line 2118 of file lscript_tree.h. Definition at line 2123 of file lscript_tree.h. Definition at line 9065 of file lscript_tree.cpp. 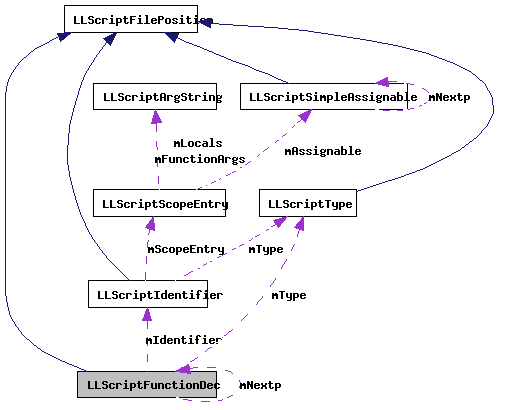 Definition at line 9106 of file lscript_tree.cpp. Definition at line 9074 of file lscript_tree.cpp. References gErrorToText, LLScriptGenerateErrorText::getErrors(), LSCP_EMIT_ASSEMBLY, LSCP_PRETTY_PRINT, mNextp, and NULL. Definition at line 9111 of file lscript_tree.cpp. References LLScriptByteCodeChunk::addBytes(), LLScriptScope::addEntry(), LLScriptArgString::addType(), LLScriptScope::checkEntry(), LLScriptFilePosition::fdotabs(), gErrorToText, LLScriptGenerateErrorText::getErrors(), LLScriptType::getSize(), gonext(), LIT_VARIABLE, LSCP_BUILD_FUNCTION_ARGS, LSCP_EMIT_ASSEMBLY, LSCP_EMIT_BYTE_CODE, LSCP_EMIT_CIL_ASSEMBLY, LSCP_PRETTY_PRINT, LSCP_RESOURCE, LSCP_SCOPE_PASS1, LSCRIPTTypeByte, LSERROR_DUPLICATE_NAME, LST_NULL, LLScriptScopeEntry::mFunctionArgs, mIdentifier, LLScriptIdentifier::mName, LLScriptScopeEntry::mOffset, LLScriptIdentifier::mScopeEntry, LLScriptScopeEntry::mSize, LLScriptType::mType, mType, NULL, LLScriptIdentifier::recurse(), LLScriptType::recurse(), S32, and LLScriptGenerateErrorText::writeError(). Definition at line 2135 of file lscript_tree.h. Definition at line 2136 of file lscript_tree.h. Referenced by addFunctionParameter(), and gonext(). Definition at line 2134 of file lscript_tree.h.